Rakennuskasino - thanoscardgamess jimdo page! This features a suite of three games (Rakennuskasino, Kasino and Royal Casino) belogning to the family of casino fishing games. Rakennuskasino and Kasino are popular in the nordic countries (especially Finland), and Royal Casino is an extension of the well known Casino (or Cassino) game. Due to the relatively larger number of card combinations they require in general more skills and memory than the usual Casino game. 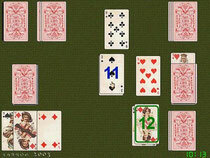 In brief, in addition to the rules of Casino, these games use numerical values for the court (face) cards. Also, in Rakennuskasino, when on hand, aces have the value of 14. When on hand, the 2 of spades has the value of 15, and the 10 of diamonds the value of 16. The nordic Kasino game is the same with Rakennuskasino, but with the absence of any build mechanism. Also, in Rakennuskasino and nordic Kasino, the most of cards score 1 point and the most of spades score 2 points instead of 3 and 1 accordingly as in the Casino and Royal Casino games.